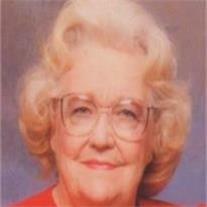 Luise B. Holmes, 90, born January 30, 1920 in Salt Lake City, UT passed away May 10, 2010 in Mesa, AZ. She retired from the City of Mesa and was an accomplished artist and published poet. She was a devoted temple worker for over 20 years. She was preceded in death by her husband James C. Holmes; daughters Marjorie H. Weeks, Becky Lee Stephens; sons Stephen T. and James C. Holmes. She is survived by her children Lynn Jackson, Leslie (Herbert) Snyder, 12 grandchildren, 26 great-grandchildren and 3 great-great grandchildren. Services will be Saturday, May 15, 2010 at 10 AM at the LDS Cornerstone Ward, 422 E. University Dr. in Mesa. Arrangements by Bunker’s Garden Chapel.